Looking at food production statistics can be depressing. In the United States in 2015, some 9bn chickens were raised for their meat. The corn and soy used to feed them amounted to more than 57m tonnes. In China in 2013, 715m pigs were slaughtered, up from 565m in 2007. This all generates vast volumes of greenhouse gases and of waste – and does massive environmental damage. Worldwide, new statistics from the UN Food and Agriculture Organisation suggest about a quarter of all greenhouse gas emissions come from agriculture, and that overall emissions from the sector had increased to their highest ever level in 2014. And then, once food has been produced, about a third of it is wasted – equivalent to 3bn of those 9bn US chickens being raised and slaughtered for nothing. This means, as argued by Liz Goodwin, former chief executive of the respected WRAP organisation (Waste and Resources Action Programme), that if food waste were a country, “it would be the world’s third largest emitter of greenhouse gases, only behind the USA and China”. All the evidence points to a serious problem in the production and consumption of food. 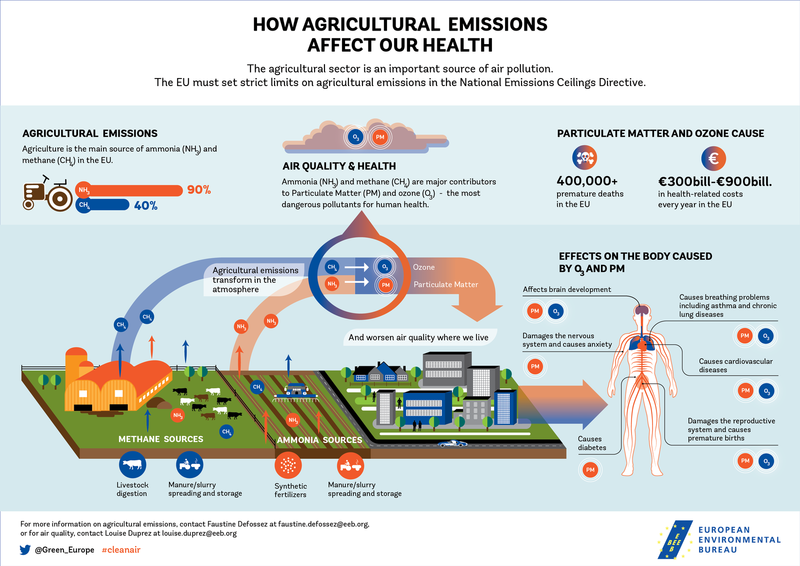 And yet, agricultural emissions have received far less attention than other, industrial, emissions, which are subject, for example, to emissions trading schemes. Essentially, reducing emissions from agriculture means putting less fertiliser on the fields and eating less meat. 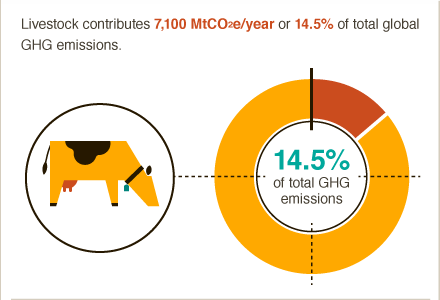 Greenhouse gases from fertilisers and manure make up about 38% of the emissions impact of agriculture, while methane from animals makes up about 40% (according to the UN FAO, 1990-2014 average). Rice production, even though the crop is the daily staple for about half the world’s people, contributes only 10%. Excessive fertiliser use is an issue for producers. It can be tackled by improving efficiency so that farmers only apply precise amounts of fertilisers to the right places – something that technology can assist with through better mapping and smart technology that applies feed only to where required, for example. Capturing emissions from manure and turning it into biogas can also help. 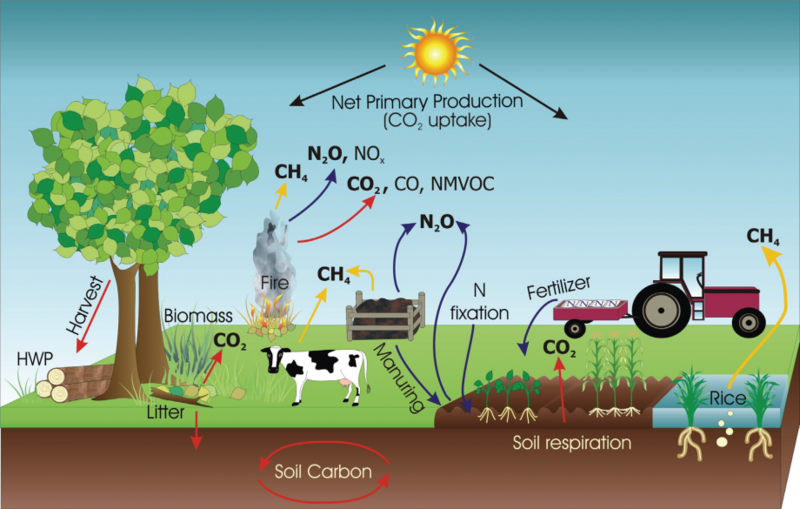 As can more use of organic fertilisers, and less-intense production – turning the soil on fewer occasions means lower nitrous oxide emissions. And, of course, some crops, such as peas and beans, fix nitrogen in the soil rather than allowing it to escape into the atmosphere. Reducing meat consumption, however, is very much a consumer issue. Driven by consumer demand, many companies have evolved business models based largely on the cheap production of meat – the fast food giants, for example. And consumers are typically resistant to being told to eat less meat, with only about a third saying they are willing to do so. This consumer resistance has made politicians wary of stepping in, resulting in little more than moderating meat consumption being encouraged through healthy eating initiatives. China, however, might be getting ready to lead the way, with a plan to halve per capita meat consumption. Whether this will have much chance of success amongst the country’s growing and increasingly affluent middle classes remains to be seen. Food waste, meanwhile, cuts across the other issues and is clearly an area where companies can act. Less food wasted means scope for reducing both fertiliser use and meat production – and reduced emissions from food waste itself. Less food waste could also cut the need to make more land available for agriculture, in turn reducing pressure on areas at threat of deforestation. Companies are already taking steps in these directions, such as the WRAP Courtauld Commitment for example, in which UK supermarkets have cooperated to reduce both food and packaging waste. There is much scope for efficiency and business can help take the big bite necessary out of food-related emissions, rather than just nibbling around the edges. If you’ve any comments, do get in touch at businessbrief@innovation-forum.co.uk. Republished here from our weekly eBrief at Innovation Forum. Sign up for weekly updates here. Upcoming business sustainability meetings, all debate, no PPT! Identifying and mitigating supplier and other third party risks is ever-more vital for extractive sector companies. This Innovation Forum webinar with Thomson Reuters will focus on third party risk assessment and how due diligence can be extended to cover supplier risks and social accountability issues. Register for free here.